As the protests in Hong Kong continue to rage on, the demonstrators are relying on their smartphones more than ever before to communicate with each other and spread the word on the web. 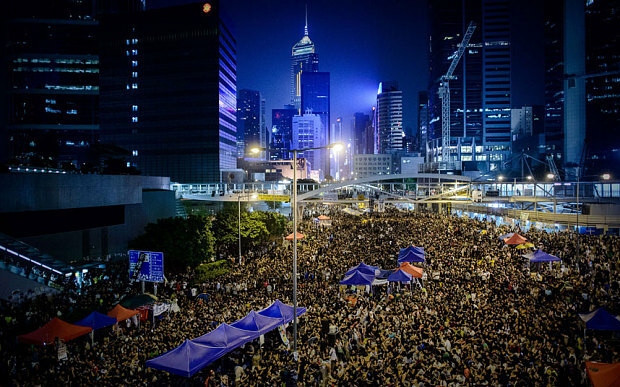 While the world wonders what will happen next, protesters are preparing for China to crack down on communications by increasing government censorship. Many protesters are concerned about the possibility of China taking even bigger steps, like turning off cellular networks or internet access. Amid all of these concerns, people in Hong Kong are turning to a Peer-to-Peer (P2P) app, FireChat. FireChat uses P2P mesh networks to create a connection that enables users to communicate without cellular networks. This P2P connection allows individuals to exchange text and image messages so that they can keep others updated. In a 48 hour period, the app was downloaded over 210,000 times and over 2 million conversations were initiated. This is one extreme use case that has seen a benefit from using decentralized P2P technologies, but it was also used in similar situations in Iraq and Taiwan. One of the many advantages of P2P technologies is that since connections are made directly between users, it becomes very difficult for a person or an organization to turn off or take information from individuals. FireChat is also frequently used in different circumstances in India, where “last mile” connections to users are unreliable. About 10% of the apps current user base is in India, where the P2P technology helps make the internet more geographically agnostic. In circumstances of overloaded or underprovided server access, P2P can provide users with a much higher quality of service.